Conventional Mortgage Down Payment : How Much Do I Need? You want the best mortgage for your lifestyle and your pocketbook. Whether to choose a conventional mortgage or a government-backed loan such as a Federal Housing Administration (better known as FHA) may seem a little ambiguous and confusing. The FHA offers 3.5 percent down payment loans. That sounds great especially if you don’t have a lot of money. But did you know that conventional loans now give borrowers the opportunity to put just 3 percent down for a mortgage? How can you decipher all this and choose the right one? Click here to check today’s conventional loan rates. 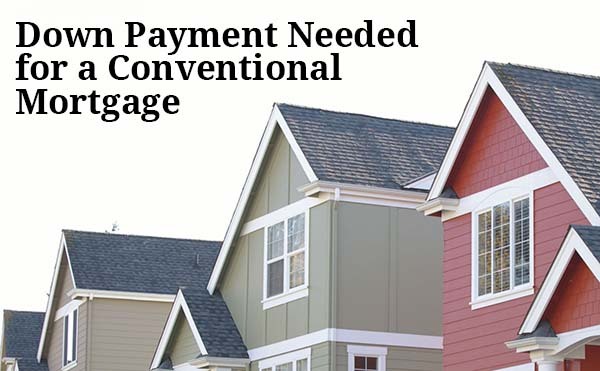 Low Down Payment Conventional Mortgage Better than FHA? FHA loans are backed by the government and issued by participating lenders. When you get a conventional loan, there are no such governmental guarantees. That means the risk, if you default on the loan, is assumed by the lending bank or loan company. What that means to you is these low-down payment conventional loans aren’t just given out to anyone. The underwriting guidelines are tougher, requiring a pretty good credit score, lower loan-to-value ratio, good income and future income, and a nearly unblemished credit history. If you plan on getting one of those 3 percent down payment conventional loans offered by Fannie Mae or Freddie Mac, you need at least at 680-700 credit score, and you need to pay your bills on time, Stevenson says. Click here to check your 3% down eligibility. Stevenson works with all kinds of borrowers who have everything from more than 20 percent down to those who have nothing to pay for a down payment. Believe it or not, there are loans for those who have saved zero dollars. Plus, there are lots of down payment assistance programs to help people across the country to buy a home. USDA and VA loans require no down payments, but you have to be eligible for them such having a low to moderate income and buying a house in designated rural or suburban areas for the USDA loans. And of course, to receive a VA loan, you have to be a current or retired military person or spouse. “Conventional loans are very popular still. Older people usually have 20 percent down because they are downsizing or upsizing, and they sell a house. They put that money towards a new place,” Stevenson says. But she usually sees the majority of people putting somewhere between five and 10 percent down. With at least 5% down, conventional loan rates drop compared to the 3% down option. For many people without 5% down, the dilemma is whether to get a conventional loan over a FHA loan when they only have a little down payment. Both loans require mortgage insurance. Conventional loan borrowers making a down payment of less than 20 percent will need to get Private Mortgage Insurance (PMI). The good news is that once you reach a loan-to-value ratio of at least 78 percent, you can cancel the insurance. The bad news for FHA loans is that the mortgage insurance stays on it for as long as you have the loan. That can add some big bucks each month to someone’s bill. Stevenson says that if someone is buying a $200,000 home with a conventional loan at 3 percent down payment, the interest rate might be about 4.62 percent – higher than an FHA loan of about 3.5 percent. And remember, all of this really hinges on your credit score – if it’s in the 700s, you get a lower interest rate. Fannie Mae charges points – AKA extra fees – to do their 97 percent loans. Typically borrowers pay those fees by accepting a higher rate rather than paying out of pocket. So the rate ends up quite a bit higher than that of the FHA option. The monthly PMI for the conventional loan will be $151 a month. With an FHA loan on the same $200,000 house, PMI will be a little lower ($137 a month) than the conventional loan. Before taxes, you would pay $1,148.43 for the conventional loan each month. The FHA would be a little less at $1,018.82. The upfront mortgage insurance for FHA is rolled back into the loan and the monthly mortgage cost is reduced, she says. But remember that once you hit that 78% loan-to-value point (in other words, have 22% equity), that $151 a month PMI goes away on the conventional loan. And with a conventional loan, you can put down as much as you can afford, which will help lower your monthly payments. But remember not to leave yourself without any money for emergencies such as a busted water heater or broken window. Stuff happens, and you need a fund set aside for such purchases and repairs. It’s hard to tell if an FHA or conventional loan is best option for you just by reading an article. You can receive live quotes from real lenders now. Click here to start the rate quote process.